Edge. 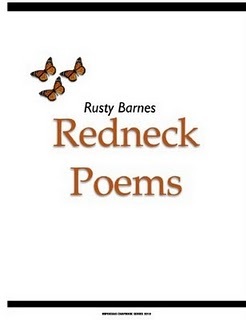 Rusty Barnes work will walk you out to the edge, ask you to look over, and consider whether you feel your stomach drop or your eyes water as you read. This is the real thing. Barnes grew up in rural Appalachia and his words are shot through with those Appalachian roots. Barnes creates an image that arouses all the senses in the opening of “When the Wrong Words Get Said:"
Hey congrats, Rusty -- and a Merry Christmas to you and family. Hope our paths cross at one of the LaVancher/Friedman gigs.